Riley, the 11-year girl in Pixar's "Inside Out" is actually a real girl. She's your little girl, and my little girl. She's your niece, your cousin and even your son. Controlled by emotions, as we all are, Riley's mind consists of Joy (Amy Poehler), Fear (Bill Hader), Sadness (The Office’s Phyliss Smith), Anger (Lewis Black), and Disgust (Mindy Kaling). I had the pleasure of hearing Jonas Rivera, the Pixar producer of "Inside Out", speak at length about where the movie idea came from during the Disney Social Media Moms Celebration last month. What he had to say was humorous and touching. Simply stated, a father on the team was having trouble reading his daughter's emotions and understanding her needs as easily as he could before she was a teenager. And that is exactly what "Inside Out" is. It the story of a girl going through a time in her life that really isn't all that great. She is moving from Minnesota to San Francisco, leaving her friends, her roots and teammates behind. Upon her arrival to her creepy new home in San Francisco, things go from bad to worse. Yet rather than be honest and express her displeasure and fears, she pretends to be the perfect, happy little girl her parents love. In fact there is one scene in the film where her mom asks her to put on her smile for dad's sake. Because in real life, sadness is viewed as weakness. It is here where the film takes off and becomes a psychological trip told in the most imaginative Pixar world yet. The core of the story being perky and annoying Joy facing off with mopey Sadness in a battle of emotions that starts at the hub of Riley's consciousness and spreads across five "personality islands" that are the essence of who Riley is. This movie is intelligent and the story is unique. 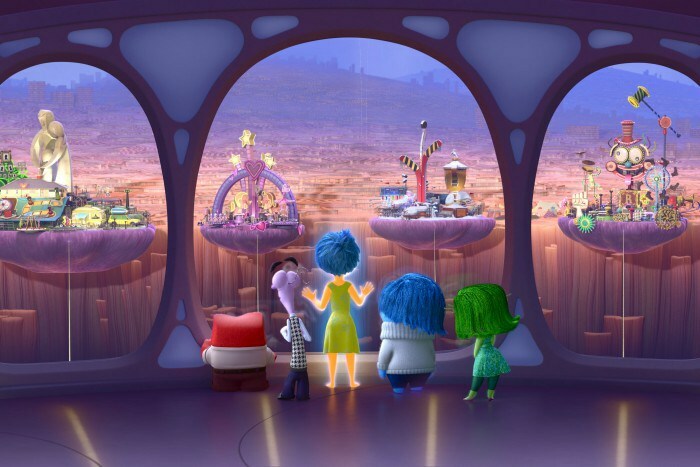 Visually "Inside Out" is the equivalent of the best, most insanely colorfully deranged dream you've ever had. As Joy and Sadness travel on this journey through Riley's mind, trying to save her by restoring her core memories, we encounter several characters and concepts that will have adults thinking and children smiling (because most of it will go over their heads, but it still looks great). One particularity charming character is Riley's childhood imaginary friend Bing Bong. An interesting comment I've heard regarding "Inside Out" is that unlike other Pixar films there is no villain or antagonist. I disagree. Joy is manipulative, overbearing and controlling. Joy wants to control Riley completely and make sure she never experiences Sadness. Just like those pills the pharmaceutical industry wants you to think you need to be normal, Joy insists her emotion is the right emotion and Sadness is wrong. She displays very villainous behavior, although it comes across as harmless. Bring the tissues, because we all know that in order to have Joy there must be Sadness. My daughter and I gave this one 5 soggy soaked-with-buttered-popcorn-and-tears napkins. "Inside Out" opens June 20th.